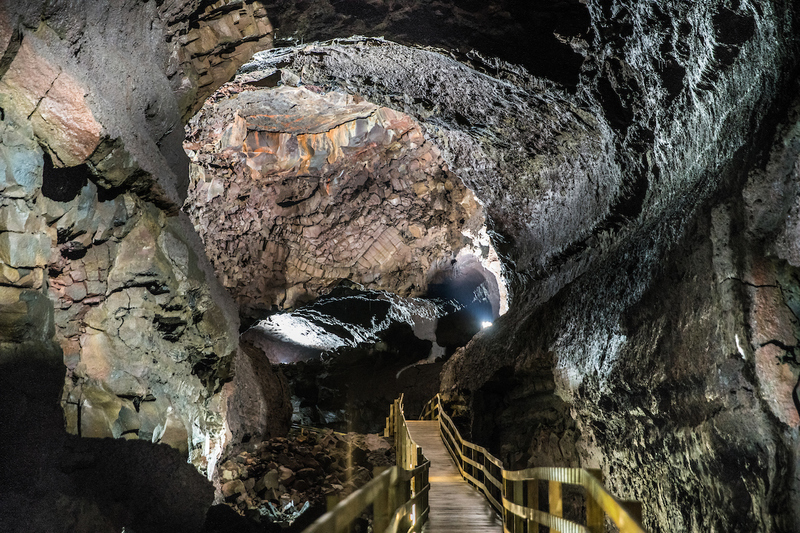 Enjoy all the wonders of the spectacular Víðgelmir lava cave on this guided tour into one of Iceland’s largest and grandest caves. Take a guided stroll and admire a colourful underground world on an unforgettable trip the whole family can enjoy. 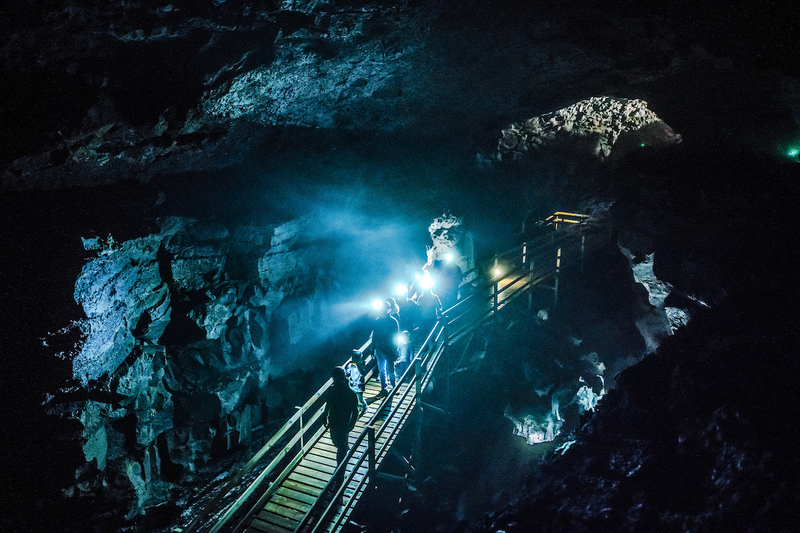 Caves can often be dark and tight, but this is not the case with Víðgelmir lava cave. After descending into the cave, you’ll walk through a narrow tunnel, which is the only tight space you’ll encounter on this cave tour. The cave then opens into a wide space with countless of icicles, amazing colour display and rock formations. In winter you can see some beautiful ice formation as well. Leading from one great hall to the next, the access walkway is lit with fixed lights at selected locations so when the light hits the icicles they sparkle, and the colours of the walls become rainbow-like. The tour guide will at one point turn off all the lights in the cave, so you’ll be able to experience the striking contrast between the light and the darkness. Víðgelmir cave is a short drive from Húsafell, a popular destination for travellers in western Iceland. For those travelling by bus or those who would prefer not to drive themselves, pickup for this tour is available from Hótel Húsafell. Just shy of 1600 metres long and around 150,000 cubic metres (m³), Víðgelmir is one of the biggest caves in Iceland and one of the largest lava caves in the world. It is located in Hallmundarhraun lava field in Iceland’s highlands. The lava field was formed over 1100 years ago, during the Viking age, when volcanic craters from under Langjökull glacier erupted. 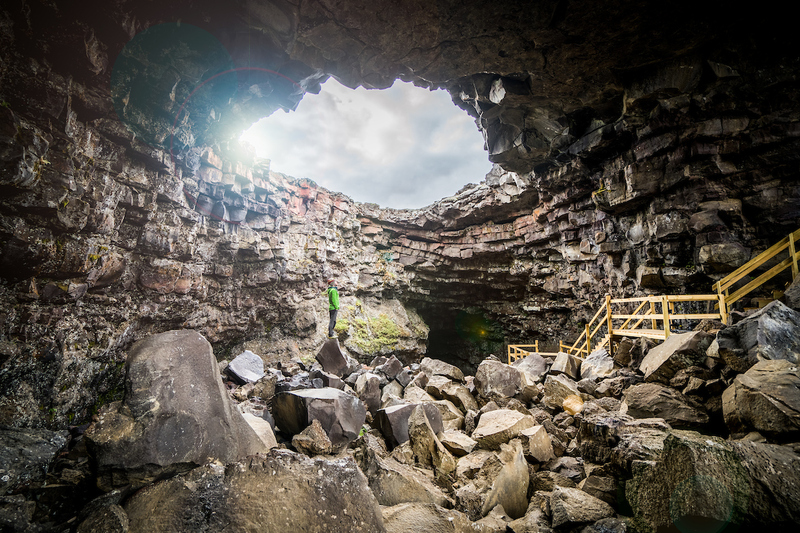 Formed by flowing lava moving under a hardened surface, Víðgelmir lava cave is one of Iceland’s hidden treasures that is well worth seeing. Don’t miss out on exploring the stunning beauty of this magical underworld on this family-friendly trip. Check availability by choosing a date. Departure time : 09:00, 10:00, 11:00, 11:30, 12:00, 13:00, 14:00, 15:00, 16:00, 17:00, 18:00. All tours start at Víðgelmir service House. NO PICK UP IS AVAILABLE. Professional guide. Helmet and Headlamp. Warm clothes, gloves and a hat with no brim. Bring a camera and your best smile. The lava cave was really cool! An experience not to be missed while in Iceland. The cave itself was very interesting wtih various features to look at. The path itself was easy and not strenuous. Our tour guide Maria was friendly and very knowledgeable. I highly recommend this tour! Our guide was the fellow who built the walkway in the cave, lives on the land and knows everything there is to know about Lava caves (very informative)! Although our tour was the first clear day after a two-day snowstorm, we were still able to make it. I was a bit nervous driving on the long and narrow, snow-covered and ice frozen road.... but we made it and it was worth the trip! Absolutely excellent! .. Our guide was extremely informative, and very personable. He was very good about helping some of the folks on the tour to make sure they had good footing, etc. and took the time to make sure that everyone's questions were answered before we moved on to each section of the cave. Well worth the drive, it's something we will never forget! Very nice, and our guide (lets say brian because i cant spell his name) was so great. I was hoping that we could go all the way till the end, but it still was worth of it. An excellent tour of a fantastic cave. Guide was very friendly, knowledgeable, and excited to share with the group. Also a beutiful drive to the area and the cave isn’t far from the start point for the glacier tour, so it’s very easy to double up and go from the top of a mountain to underground parking in one day. A wonderful experience. Our guide was super friendly and very knowledgeable. Our tour group was the last of the day and was very small so we were afforded some fantastic photo opportunities. Very cool lava cave and well run family business. This was one of the coolest things we have ever done! We had Megan as a guide, she was the best and super intelligent and brings a good sense of humor to the tour! The cave was unreal! The colors the going back and seeing a snap freeze of time from The past, we loved it! I can’t recommend it enough! :))))))) we will be doing it again in the future! We enjoyed very much the tour. Guide was very knowledgeable and explained about volcanoes and how lava cave was formed. Tour is good for everybody as path is safe and with artificial light. At the end we had total darkness and was a nice experience. The reception place is good as they had toilets and also sells snacks/drinks. We arrived about an hour and a half ahead of our scheduled time (5pm) and they allowed us to attend the 4pm tour. The tour guide was very knowledgeable and entertaining, and I enjoyed the service aspect of it very much however I was a little disappointed as the photos (posted above) show a lot more colour than what I saw. The tour was still cool though. We really enjoyed this tour of a Natural Lava Cave! We have been in a lot of caves but never a lava cave. We learned about how the cave was formed and why there are different colors and textures throughout the cave. Our teens also enjoyed the excursion and would reccomend the tour. 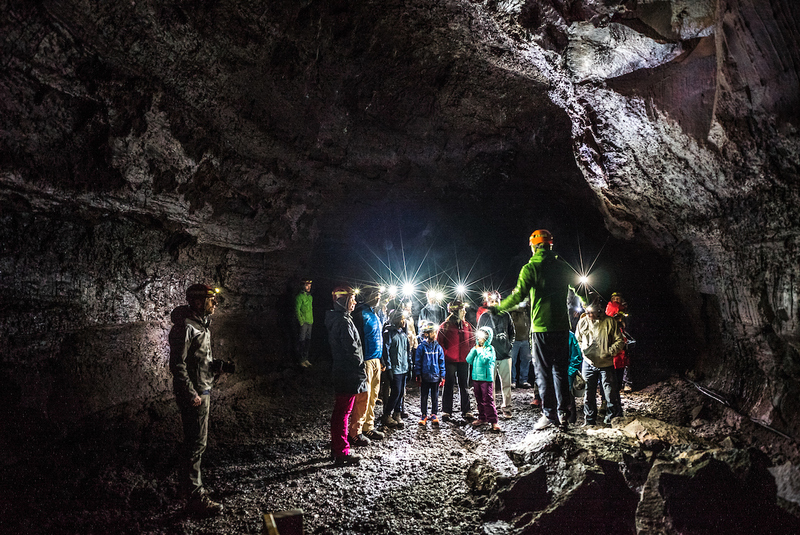 It was a real adventure with Emilia...going down in that huge lava cave... it was a nice expérience to live total darkness The kids and ourselves learned a lot about Icelandic volcanoes... I recommend this tour..
Beautiful drive, amazing landscape, wonderful tour! Like no other place on earth! Just the surrounding nature of the cave is worth checking out, The cave was incredible and I would say a must do for anyone near the area. The guide was informative and entertaining! I highly recommend it! Guide was knowledgeable and funny. Interesting drive to the cave and fun experience actually in the cave. Nice and easy your! A great cave and a great tour! The guide is very informative and professional. What really surprised us is the experience called "Nothing to see in the cave" when all the headlights were turned off. Completely dark only can hear the drip of the water. Definitely will try the Cave Master next time! Following a professional guide is a must. Makes it so much more fun and informative. The guide was very funny and engaging. I consider myself a big Iceland nerd and it's a pleasant surprise to be able to learn so much more about the volcano systems and lava formations in Iceland. The highlight of the trip for me was the darkness time. When everyone turned off their headlights, it was pitch black, a total luxury in this modern time. Also liked the short walk from the hut to the cave. A lot of moss and wild flowers. For this amount, it's definitely a worthwhile activity. This tour really surprised me. The cave is really impressive and the guiding is very well managed. A great trip! 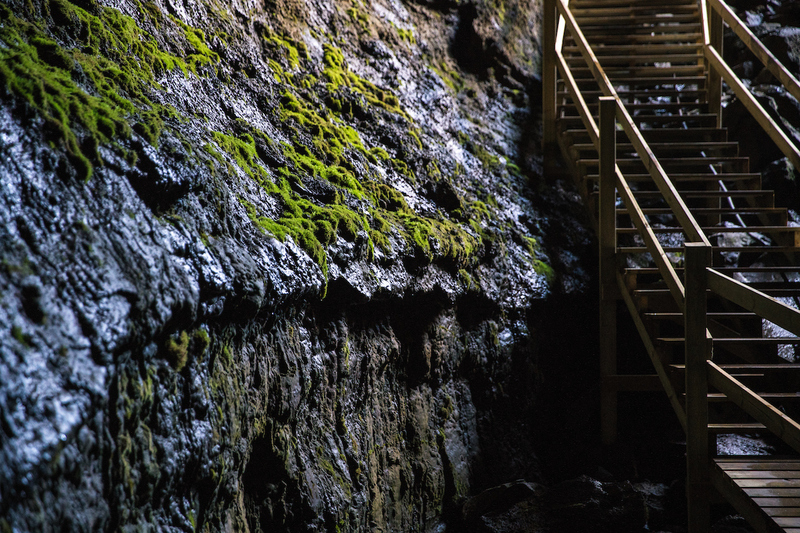 The longest lava tube on the planet is a must visit. The total darkness experience is freaky and wonderfull at the same time! Can advise this tour to everyone!